The Pyrenees offer stunning hiking country. No walks beneath, or even across, their rugged and imposing peaks will disappoint. However, some areas have a little bit more of a 'wow' factor than others. 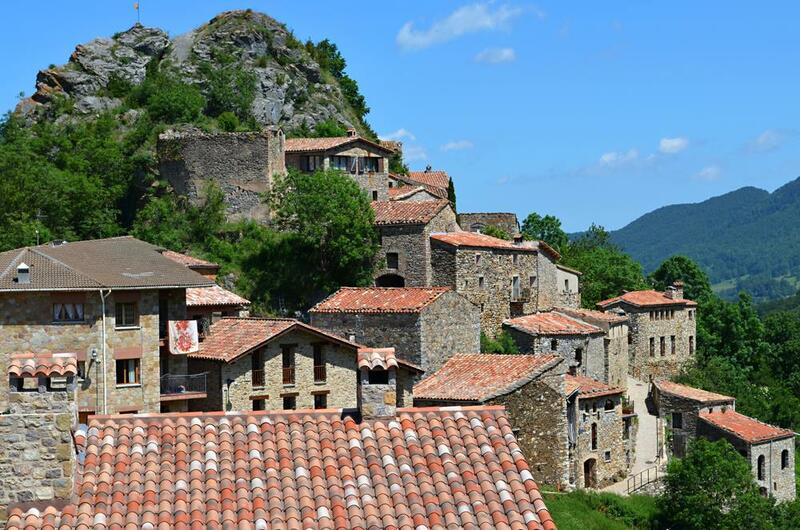 These are the places in the Spanish Pyrenees in Catalonia that left me gasping for breath. Pilgrims have been drawn to the Vall de Núria since the 13th century. It is possibly one of the most beautiful places on the planet you are likely to set eyes upon. The valley's petrol blue lake contrasting against emerald plains and pine clad mountains creates a vista of outstanding beauty. However, it's not a secret valley; a rack railway brings modern day pilgrims in their droves and the valley floor - where there's a hotel, restaurants and play areas - can get extremely busy. 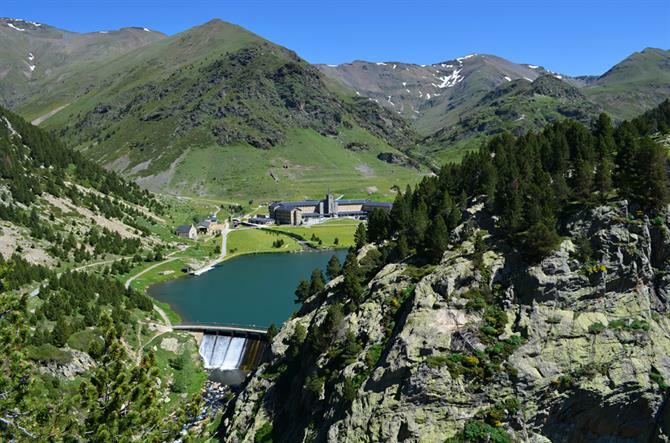 A series of walking routes offer escape from the crowds... and even better views of the Vall de Núria from above. 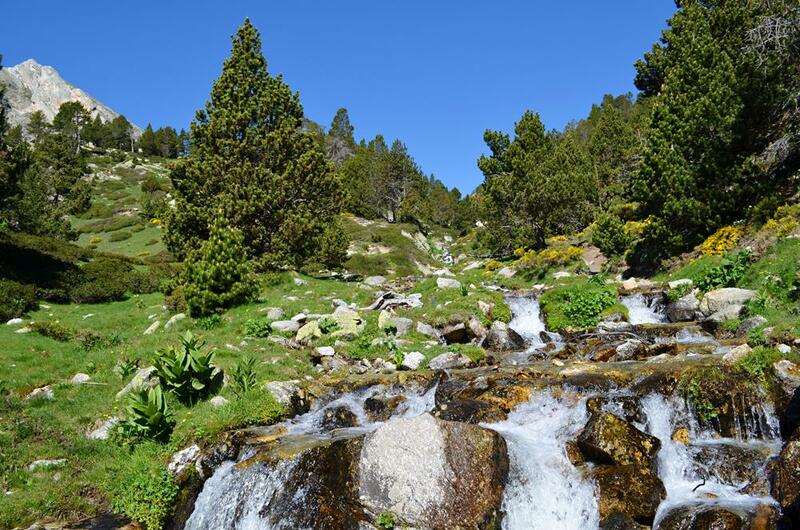 These range from shortish circular walks around the valley – through pines and plains and past the stations of the cross – to an exhilarating trail that descends with the Núria river all the way to Querelbs and Ribes de Freser. Setcases is a pretty little town with Alpine good looks, a super cheese and mushroom shop, and its own golden sand, riverside beach. It's an ideal base from which to set out on walking routes that are full of the ubiquitous 'stop you in your track' views as well as unusual and interesting features. Top choice is to arrange a transfer to Ulldeter and follow the mountain stream up to the Refugi d'Ulldeter (a cosy refuge even if the coffee is expensive). From the refuge, climb through meadows carpeted by delicate flowers to reach narrow ridges in touching distance of France before descending back to Setcases through a wide ravine where jacas (grazing lands) are home to cows, wild horses, isards (chamois) and cutesy marmots. Alternative routes climb out of Setcases through the pine forest, passing crystal pools beneath gushing waterfalls; one of which looks like an overflowing champagne glass. This long meandering valley in Girona winds through picturesque hamlets and has routes that are not quite as thigh muscle unfriendly as other areas of the Spanish Pyrenees. Easy valley floor trails link Vilallonga with eye-catching La Roca, sleepy Llanars and, the pick of the bunch, Camprodon; a peach of an historic town with an ancient 'new' bridge. Hiking in Vall de Camprodon can be deceptive though. Attempt the ridge walk that runs above the valley and the 'not for the faint-hearted' path reaches the 1900m mark. Even a seemingly innocuous ascent to the Ermita de Sant Antoni above Camprodon can involve dragging yourself up near vertical slopes using chains. The 360 degree views at the top make it worth the effort... and it's fun anyway. As well as being quite a mouthful, the park is a magical place for walking. Apart from being epically beautiful, legends are rife in these parts; from the story of the little men of the Pyrenees to Encantats peaks which are said to be two hunters turned to stone for defying the gods. Even the most challenging route in the park, the carros de foc (Chariots of Fire), has the feel of a tall tale about it. The story goes that park rangers visited the nine refuges in the park, a distance of 60km, in the one day, hence the Chariots of Fire label. But there's no need to kill yourself to enjoy the best of the park. 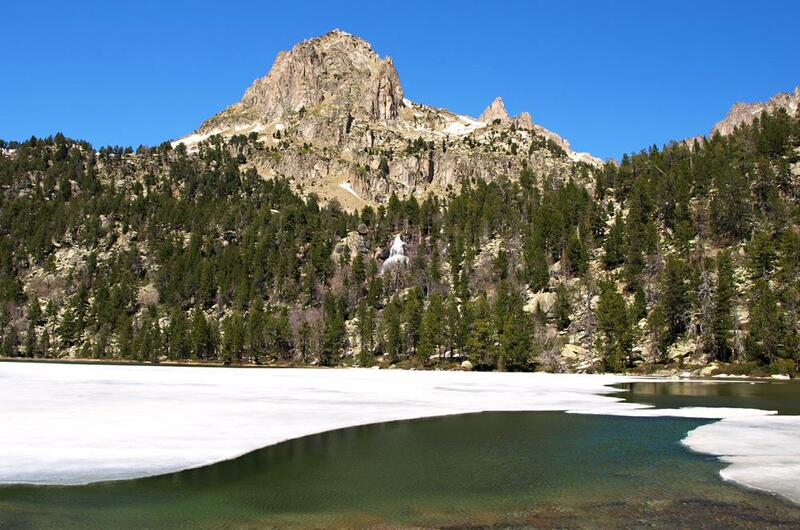 A relatively short route from Sant Maurici Lake to the Ratera Lake, still covered in ice in May, throws up some of the most inspiring views you'll see in the Spanish Pyrenees.